Ever had brothers or parents snooping around your bedroom looking for your phone or your wallet? Well! I have the perfect home made hidden spot to hide your goodies in a place no one would think to look. To your left is what we are making, no not a full tissue box. And no, not the chair or the bag or the wall, nor are we making a picture that looks like the one to the left so just stop thinking and listen. We are making the tissue box, but that is no ordinary tissue box. It actually has a secret compartment underneath it. Lets get working on it, soon you’ll understand. OKAY! Time to start making. First turn over your empty tissue box. And cut the base of it off. Make sure there is a little bit left on the corners to stick blue tack later. 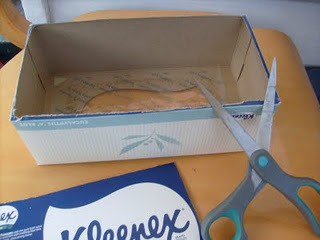 Stuff the layered tissues carfully in the top of the empty box, becareful not to pull apart the layers. Look to the image to the left to get an idea. Once you’ve stuffed it in it should look like . . .
As you can see the layered tissues have been stuck in and are flat. Fluff it up a bit so it looks naturally like a real tissue box. Well, it is a real tissue box except this one has a hidden area underneath it, which you can place your phone, wallet then stick the tissuebox on top. No one would think to look under a tissue box! Well, I wouldn’t anyways . . .
Next get your bluetack, if you have bluetack, and stick some in each corner under the box. As shown in image to the left. Turn the tissue box over and place it on the desk or where ever you are going to place your hidden area. Lightly push it down onto the desk, table etc. What this does is if someone geniually does need a tissue they won’t pull the whole box up off the table when taking a tissue. Because then they would discover your secret area. Nowyou have to do is hide your stuff underneath the tissue box! You now have a hidden spot that no one would look under! This isn’t the only hidden area you can make with tissue boxes . . . look. I also have a hidden draw coming out of one of my tissue boxes . . .
There’s alot you can make with them so have a think! Come up with something amazing. Comment and tell me how you went with this project. I want to know if you liked it. Well hope you completed this okay people! Thanks, and enjoy your new hidden spot!! !